Salesforce team members kicked off the energetic morning alongside City Year and community officials. 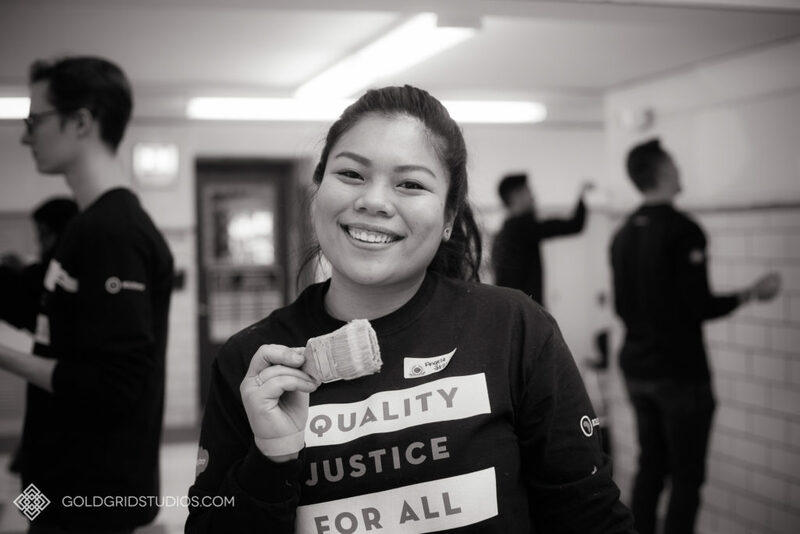 On the morning of January 21st, Salesforce partnered with City Year at Deneen Elementary School alongside several community officials, organizations, and volunteers to do more than just service work. They came to make a difference by both revitalizing the hallways of this area Chicago school, and engage a conversation about the Chicago community, education, civil rights, and moving the City of Chicago forward. Volunteers, including volunteers from Salesforce, were greeted by Chicago Mayor Rahm Emanuel, newly elected governor JB Pritzker, and Janice K. Jackson, Chief Executive Officer of Chicago Public Schools. Salesforce team members worked together to beautify the hallways at the school, with fresh paint and detailed murals. Gold Grid Studios, Chicago commercial photography studio, was thrilled to join the Salesforce team on a mission to create a new look for this anchor in the Chicago community. We joined the Salesforce team in enjoying some delicious donuts and coffee for that perfect energy kick, and then got to work! After the City Year event, Salesforce hosted an afternoon of professional development. Salesforce invited area Chicago students for a series of presentations by Salesforce team members, and offered an interactive Q&A session at their downtown Chicago corporate office. Salesforce team members responded to questions about job interviews, client-interfacing, networking, and finding the right work that fuels your motivation, and then staying motivated. Participants in the Salesforce presentation engaged simulated client-to-professional interactions, spent time with Salesforce team members one-on-one to ask questions, and learned about the history and mission of Salesforce. Gold Grid Studios, a corporate photography studio in the Chicago area, loves working with the individuals, companies, and organizations who aim to make change happen. Gold Grid Studios has partnered several times with Salesforce to create beautiful corporate photography that depicts the quality of work they do, the quality of people who form the team at Salesforce, and the pride they take in every aspect of their goals and results. Having the opportunity to spend time with the company at corporate events, conferences, summer picnics, and events that directly reach out to the Chicago community like this one, we understand the impact our commercial photography has made on their company. From email communications, to outward-reaching editorials, to community partnerships, we’ve experienced the impact of our work with Salesforce and their team has influenced us. Salesforce is the world’s #1 customer relationship management (CRM) platform. Their cloud-based, CRM applications for sales, service, marketing, make it easy to connect with customers by strengthening customer relationships through managing customer interactions and information. Commercial photography should show the stories behind the relationships, the conversations that lend a new idea, ask a different question, and push boundaries. Working alongside Salesforce, we knew we had to share their story on MLK Day, and we look forward to sharing yours. How does your company reached out in the community? If you’d like to partner with Gold Grid Studios to share your story, let’s connect!